The New York Rangers’ deficiencies of talent and depth on the wings and defense have become glaring during the club’s lopsided five-game losing streak. However, the issue down the middle is a different one. 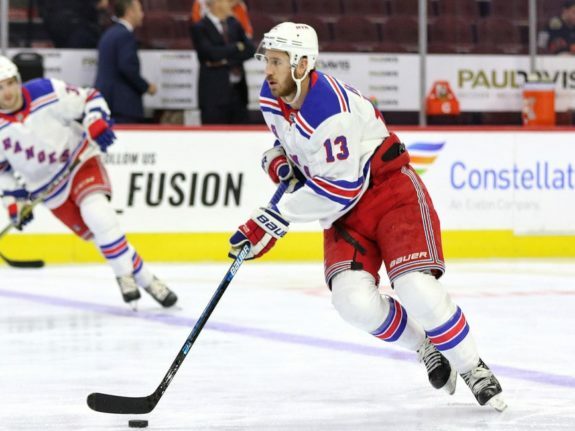 Desperate for a big-time scoring winger and starved for a stud right-handed defenseman, the Rangers face a glut of talent at center that, to make matters even more complicated, may or may not represent the full long-term solution at that position. It’s safe to say that the fanbase is officially fatigued of the “will-they-or-won’t-they” Kevin Hayes trade saga, which has found new fuel amidst the team’s recent plummet that has provided a stark reminder that this remains a major rebuilding project and not a quick turnaround under an impressive new coach. In pending free agent Hayes, Mika Zibanejad, Filip Chytil, Brett Howden and Lias Andersson, the Rangers have assembled a lot of talent at center that’s ironically creating as much uncertainty as comfort. Whether Hayes is a future cornerstone and thus deserving of a big extension is obviously the biggest question surrounding this group. Some of the other questions include: Is Zibanejad a true number one center, and should the Rangers treat him as such as they chart a course forward? When is Chytil, who the club sees as a high-ceiling talent who will eventually end up a top-six center, ready to be permanently moved back to his natural position in the middle as he continues his development, even though he has been more impressive on the wing to this point? Does Howden’s unexpected quick ascendancy to the NHL level this season amount to a nice little surprise, or the beginning of a strong career? How does Andersson, who the Rangers controversially drafted seventh overall in 2017, fit? Is there enough to his game to eventually claim one of the top two center spots, which would be expected from such a high pick, even though he hasn’t shown nearly enough to this point to suggest that he can? While David Quinn has correctly established a policy of young players earning ice time rather than being handed it based on age, the eventuality is that all of these young centers need time at the NHL level to determine what the club actually has to work with. Preferably, it would be extended time, not rationed stretches designed to keep everyone happy. The impossibility of fitting five players into four spots, and it’s really three because none of them are being groomed to become fourth line centers, has at times created a troublesome logjam despite the Rangers being a consistently out-manned team that’s otherwise starved for developing young talent. Chytil has shown flashes of excellence paired with stretches of inconsistency and little-to-no production. That’s hardly surprising for a 19-year-old feeling his way in the NHL, one that nonetheless looks like he could become a keeper. But at what spot? 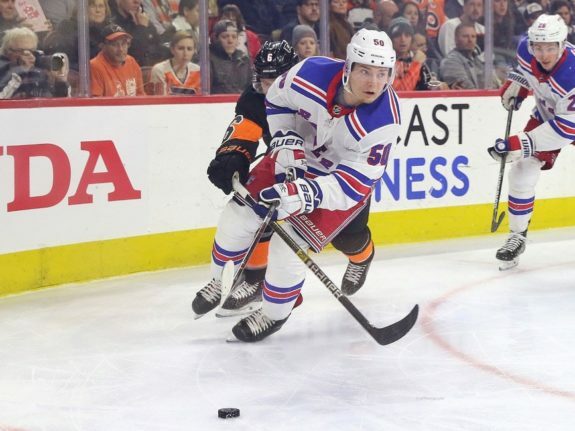 If the Rangers trade Hayes, is Chytil ready to take over what would likely amount to top-six center responsibilities? If not, and if Hayes is dealt, then who does? Hayes has missed the last four games with an unidentified injury and the results without him have not been encouraging. In the first two of those against the Colorado Avalanche and Arizona Coyotes, the Rangers were outscored 11-1 with Chytil, Howden and fellow youngster Boo Nieves handling duties in the middle behind Zibanejad. The possibility exists that Chytil might end up being better suited on the wing, but the Rangers probably aren’t going to be able to find that out before Hayes’ situation needs to be resolved. Moving out Hayes would at the very least somewhat solve the ice-time problem, albeit in the short-term. Chytil could continue to shuttle between the wing and center with Zibanejad the constant and Howden, Andersson and perhaps Nieves also rotating among the second, third and fourth spots. Andersson, who was sent back to the AHL on Dec. 28 to continue his development by getting him the ice time he needs, has yet to exhibit the elite puck skills and scoring touch one would expect from a top-10 pick. Still, there’s so much to like about his future. The Rangers aren’t going to get a full picture of his size, grit, strength on the puck and well-rounded game without committing to him playing on Broadway regularly, and not just a handful of minutes with the fourth line. At whose expense does that happen? Before being sent down, Quinn used Andersson on the wing on both sides in an attempt to get a good look. Predictably, though, Andersson made little impact at a spot for which he’s not suited prior to his return to the AHL’s Hartford Wolf Pack. He’s recorded 14 points in 19 games with the Wolf Pack. So much of this hinges on Hayes’ situation. It will be more than understandable if the Rangers decide to lock up a big 26-year-old center who is improving before their eyes and possesses a great attitude and focus to go with his talent. As far as he’s come, however, Hayes might ultimately prove not to be a top-six pivot on a contending team, and thus, not worthy of the five or six-year deal at an annual salary of $6 million or more, which he might command on the open market. 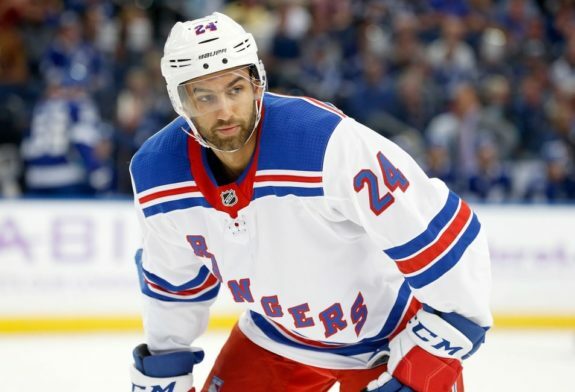 If the Blueshirts give it to him, does that relegate Chytil, Howden and Andersson – all former first round picks – to bottom-six roles for at least the next three seasons, with Zibanejad signed through 2021-22? Do the Rangers Have Too Many Centers – or Not Enough? With the Rangers flailing and fully prioritizing the future after their pleasantly surprising early season work proved to be mostly fool’s gold, it seems that the likelihood of moving Hayes is increasing. Of course, there’s serious danger in that course too. If the Rangers trade a proven, rising commodity and the unproven Chytil, Howden and Andersson eventually flame out, what then? It certainly won’t be a question of a talent glut anymore. There’s also the 24-year-old Nieves, the big, strong-skating prospect who fits the bill as a third or fourth-line center. The club’s second-round pick in 2012 is healthy after suffering a concussion during the preseason. He’s shown promise when given opportunities, but his future status on Broadway would seem to be especially cloudy given the higher-profile young pivots ahead of him. The front office appears to be in something of an impossible situation. Hayes needs to either be signed long-term before the Feb. 25 trade deadline or moved out for assets. That leaves little time for the Rangers to fully assess what they have at center and no real avenue to do it anyway, given the fact that they can’t reduce Hayes’ minutes amidst the need to market him, and Zibanejad isn’t going to be de-emphasized in order to play the youngsters. The decision is going to involve a major leap of faith either way. Though having what appears to be plenty of young options at a position is certainly a luxury for a rebuilding club, how the Rangers handle this situation has the potential to impact their future as much as the dearth of talent at wing and defense does. Yes, trading from a position of depth to fill other holes is a sound course of action, but to do it in an informed way, the Rangers need to find out exactly what they have to work with. The club might have too many future options down the middle, or they might not have nearly enough. The imminent major decision on Hayes makes that all but impossible to know until later in the process. Team officials will have to make the best possible choice on Hayes and cross their fingers that they were right. Unfortunately, they might need all the luck they can get.